Today, Tim and I got up extremely early to show up at Soldier Field by 5 a.m. for the Soldier Field 10 Mile. 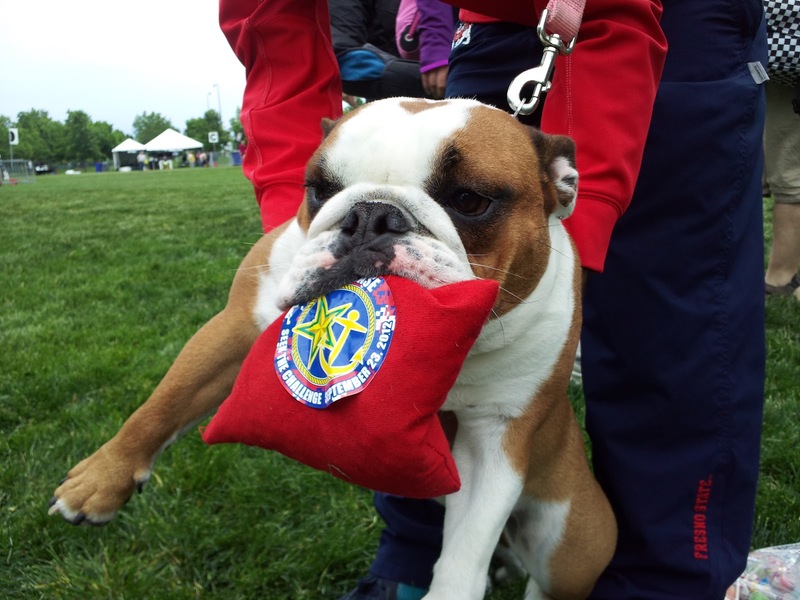 We volunteered on behalf of Salute Inc., the charitable partner of the Fort2Base Race. Volunteers get up at 3 a.m. on a weekend to spend their free time shivering in the cold to make sure you have the best race possible. There's no need to yell and cuss at us. We are here to help you. Sneaking into corrals, arguing about corrals or literally jumping over barriers to get into a corral does not make you a do-what-you-have-to, rough-and-tumble type. It just makes a runner with poor etiquette who is screwing over other runners and making volunteers doubt their own sanity and the value of humanity. The race only starts when you start, and it's not the race's fault that you didn't make it to your corral on time. Heart, a very sad volunteer. To cheer me up, I stopped by the Fort2Base Race booth and saw Caylei, the race director. She's in the styling pink pull over with our favorite Naked people. We played with the most adorable puppy ever, who loves the Fort2Base Race. 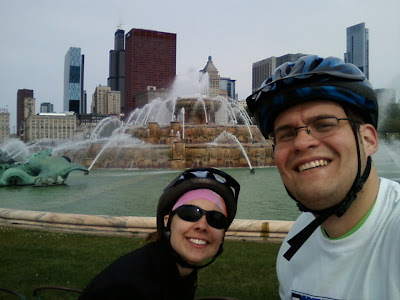 Then, we took a 24-mile bike ride up and down the Lakefront Path. It took me roughly 1:40 to finish, which doesn't bode well for my upcoming 60-mile race. The path was crowded, because it was perfect outdoors active weather, so that's the excuse I'm going with. Finally, we went to an awesome party for the lovely Jackie. It's her birthday and I ate back the 1,400 calories I burned cycling and then some. My stomach hurts from a flat out food binge, so I'm going to bed. That is too bad that people were having rotten attitudes! I do not understand the corral obsession. I think I am too slow to get it. People in my club try so hard to qualify for certain corrals at the Chicago Marathon and other Chicago races and I am just like... "It's Chicago. There are going to be people around you all the time." Sigh. I can't stand runners who are rude to volunteers. After all, it's the volunteers who make the race happen so you can run! Blargh. I volunteered for start corrals at the Shamrock Shuffle a few years ago, and I couldn't believe how many times I got yelled at. Regardless, THANK YOU for volunteering! I'm not sure why anyone would be rude to volunteers! Maybe they just hadn't had their coffee yet? I rode on the lakefront path on Monday and it was hard to keep my average pace as high as I would have liked. It is crowded, though, and windy!